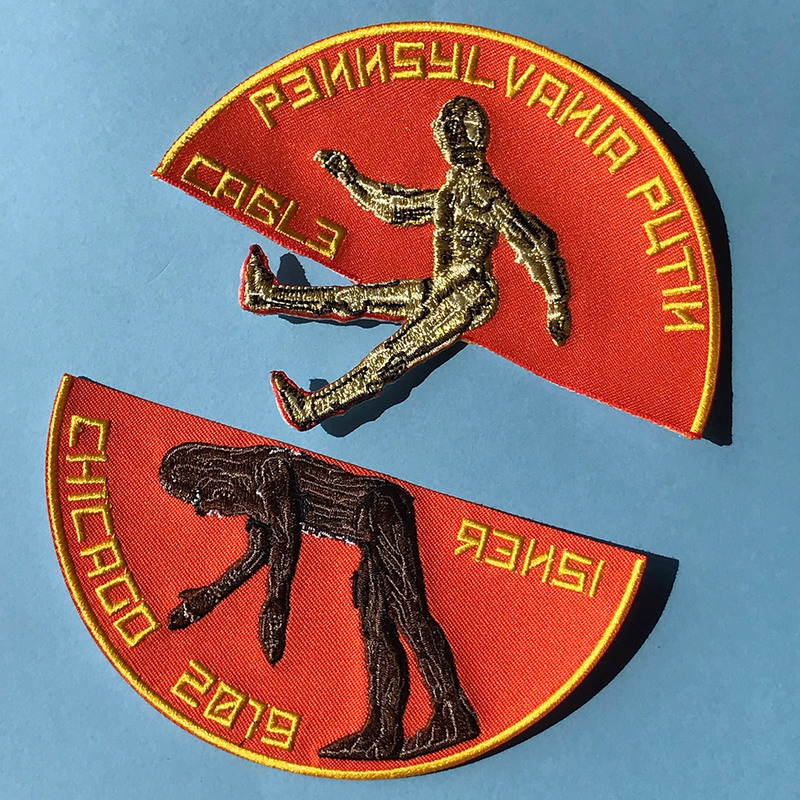 CreatureCantina.com: Designing Celebration Chicago 2019! 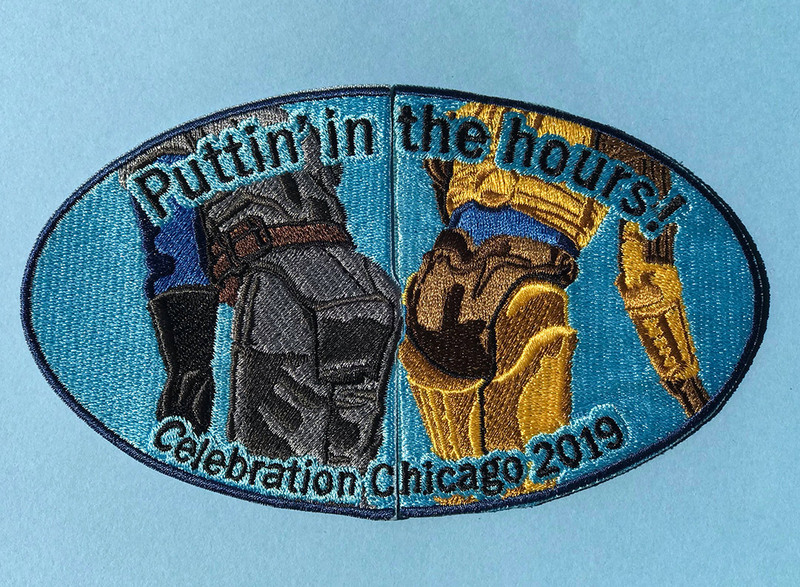 We are now two weeks away from Star Wars Celebration Chicago 2019, and it's full steam ahead. I'm pretty much all done with my prep work. I have a few odds and ends to tie up, but the lion's share of the work has been completed. I figured this week I'd put together a gallery of a selection of the art I created for Celebration. As an artist, it's a great joy to put this stuff together and see it well-received. I mean, how many people get such wonderful opportunities? Not enough, I say! All these things have already been revealed on social media. The stuff I made that hasn't... we'll you'll just need to wait for that! First off, I was asked to create the "key art" for Archive Party IV. 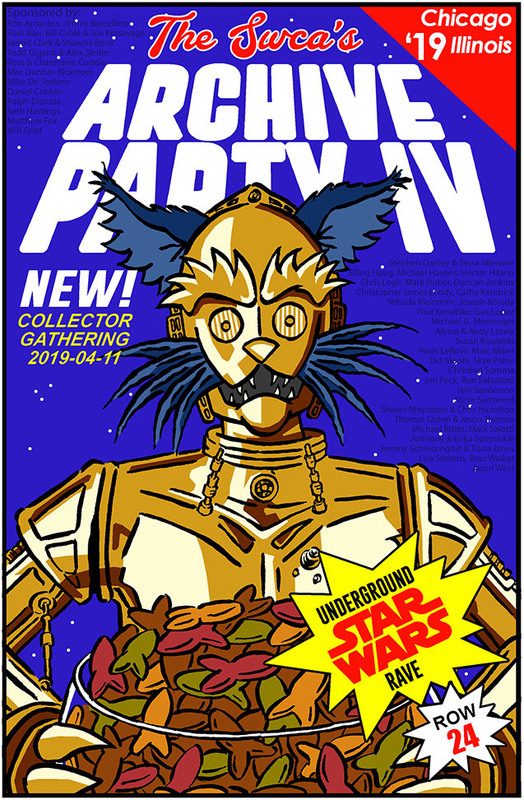 This is a take on C-3PO's cereal using the C-3FRL character I designed for the Droids-style sponsor-exclusive proof card from Archive Party III. This art has been used for promotion of the event, and also will appear on posters and patches and stuff at the party. Next, let's look at some swag! 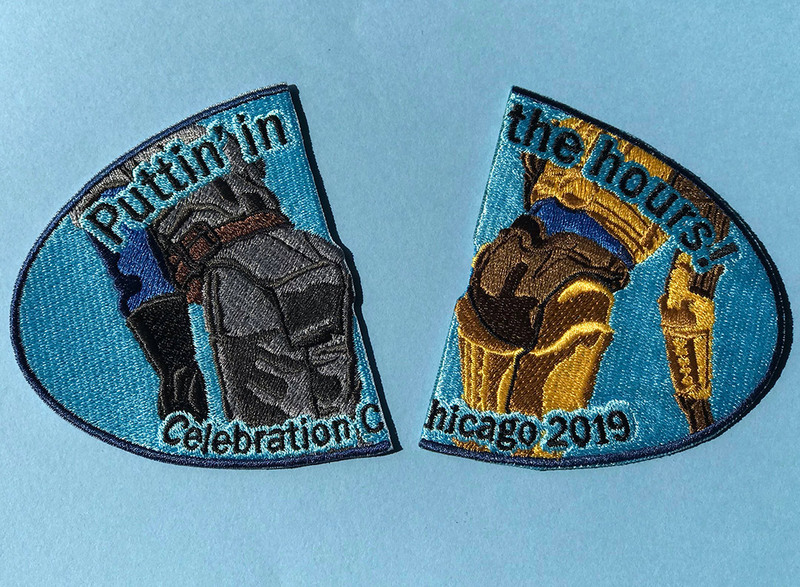 I'm gonna have like 4 different swag items to give away at Celebration, two of which are patches I designed. The first was inspired by a misunderstanding at Star Wars Celebration Europe III. And this is a sequel patch to the one I created for Star Wars Celebration Orlando 2017. I'll be puttin' in the hours once again! The second swag patch was inspired by the semi-infamous Rensi-riding spectacle at Celebration Orlando 2017. Should I be concerned that my swag these days is always inspired by my own misbehavior? And finally, I'm thrilled to share the project of which I'm most proud. 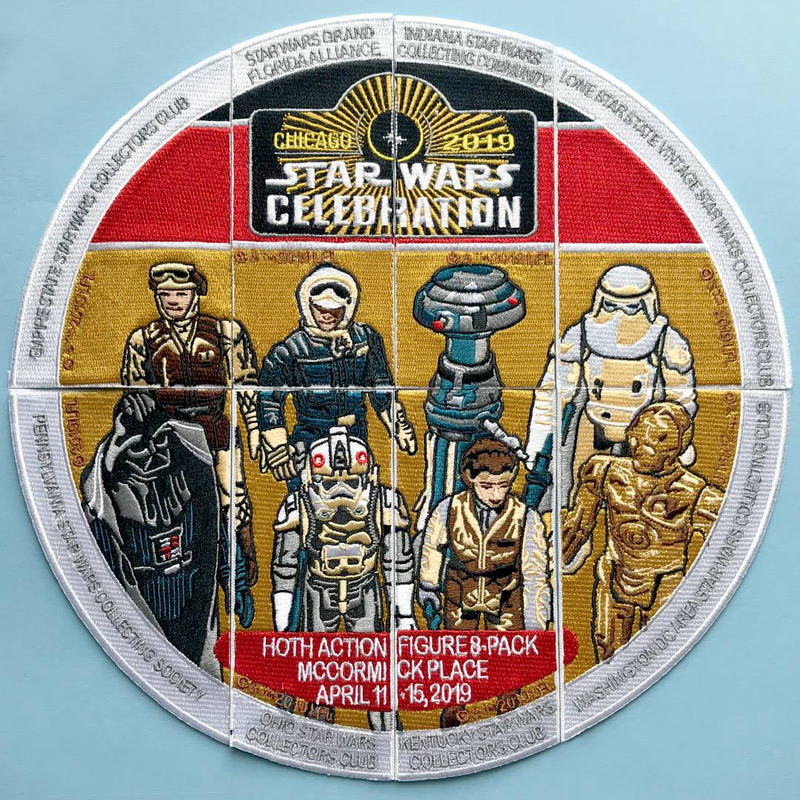 I designed the patch that eight Star Wars collecting clubs will be handing out at their booths at Celebration. I sat down last year and brainstormed just how I could possibly top the birthday cake patch from Orlando 2017. I wanted something inspired by the action figures we all love to collect, and something that could be customized to the desires of the participating clubs. And after pouring through a bunch of Vintage imagery, I settled on the mail-away multi-pack sticker from the Return of the Jedi era. And it turned out fantastic! So yeah - it's been a busy last six months! And it's all about to pay off. See you in a fortnight!